I am on my journey back – metaphorically speaking. The ‘official’ month of Autumn. October’s flower is calendula and birthstone: opal [and tourmaline]. The name opal derives from the Greek Opallios, meaning “to see a change in color“. Although it is argued that the origin may be from the Sanskrit word úpala or adapted from the Roman term opalus, for aesthetic reasons, I’ll stick to the ‘opallio’! moments before the cold white. As an exception this month’s color is only hinted in my painting as I wanted to focus more on the colors of Autumn. Opal Ten is also designed on various products! FREE SHIPPING WORLDWIDE is on at my art shop thru OCTOBER 25! Beautifully written! The colors you used for October certainly embraced it well! You are always a gem, I just came across the poem I wrote for another of your creations…they are always inspiring so I am going to repost and share again tonight! Hugs and blessings my sister! I know. And I’m very proud of it. Happy November to you, my friend! Ah, thank you, my dear Aquileana! Albeit not renewed I am gradually coming back to …normality. Very beautiful Marina. Opal is a favorite gemstone of mine too. I did not know the history of the name either. Welcome back, you have such a lovely painting for us. Thank you, my friend. May that energy keep us warm for the coming winter. Good to see you! Hearty welcome back, Marina. You may have been physically away, but your unseen spirit has been always around, in myriad colours of the seasons and warmth of its recreations in your artistic hands…best wishes. What a beautiful thing to say, dear Raj. Your hearty welcome and words mean a lot. Thank you! 🙂 My warmest wishes to you. It is so good to see you again Marina – welcome back. And what a strong entrance with this beautiful design – the warm colors of the Fall season and symmetric shapes add a quiet and purposeful energy to the piece. Yes, it’s good to have you back – you and your incredible art have been missed. Welcome back, Marina, and these are warm and beautiful; I love the colors of autumn, but our weather is still warm like summer. So I’m eager for the new season. 🙂 Many hugs! La bellezze del tuo nuovo colore, l’arancio tramonto di mezzo ottobre, apre i cuori e la mente, in nome di una nuova rinascita. Dopo il tuo ritorno, nulla sarà come prima. L’alba sarà sempre più profumata e i tramonti sempre più caldi. Il giorno, tenero amico del sorriso, saluterà la notte con un bacio. e la certezza di un sorriso. Buona notte mia preziosa amica. The beauty of your new color, orange sunset middle of October, opens hearts and minds in the name of a new renaissance. After your return, nothing will be as before. Dawn will always be more fragrant and sunsets increasingly hot. The next day, a friend of the tender smile, greet the night with a kiss. and the certainty of a smile. Good night my precious friend. My dear dear Ninni – overwhelmed [once again] by the kindness and beauty of your words. Thank you, from my heart. Impressionism is today among the most popular paintings in the world. Its colors, the quick brush strokes, the revolutionary themes, broadcast and transmit still beauty, joy of life, energy and enthusiasm. 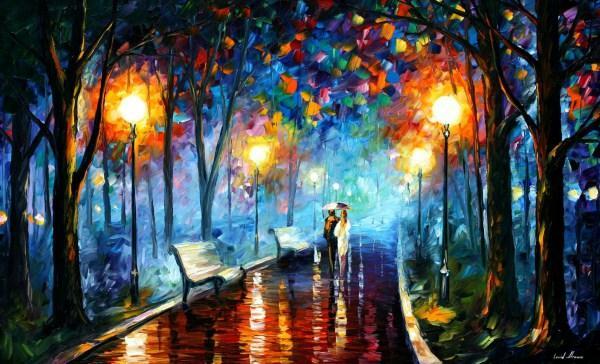 Enjoying spatulas, knives or, instead of brushes to shape oil paints (in a digitized era like ours …), Leonid Afremov manages to create landscapes evening under the heat of the street lamps, or deserted streets and wet with rain, reflections on the water, couples who set out along the road under the umbrella; with those bright colors, from red to yellow to blue canvas spread on a rainbow of colors, of light that burst in the dark. So you have that effect of a spell of a poem, beauty, “joie de vivre”, the typical French taste combined with lyricism Chagall, suspended between the dreamlike and realistic. A little ‘as your paintings dear Marina, sweet and lyrical expression of beauty and feeling. How not to appreciate the warmth and the model forms in your latest work “Opal Ten”? Even accomplishments related alllo beautiful picture, about passion and heat. Love for everything surrounding the sacred space of man and everything around you. You’re very good, and above all, very human. Beauty and pride of the beautiful land of Greece, which gave birth to civilization, currently known. The return of the gods on Olympus. Oh my! Elegant and stunning! Beautiful as always Dear Marina…:-) welcome back ! This was a break I wish I wouldn’t have to take, but such is life. 🙂 Best regards to you too, dear Jalal. Dear Marina,Opal 10 is gorgeous! I love it on the S6 products. S6 really does a great job. I’ve laundered my tights & they have come out perfect. Waiting for my “Poppies” travel mugs which should be here soon. Missed you too, Resa! I’m on a slow process coming back. Oh, I’m so happy to hear that and can’t wait to hear your impressions on the travel mugs as well! Big big big kiss and hug! Great to see you back, Marina! And what a lovely image to start with. Lovely to see you back Marina.. and Autumn is full of all of these wonderful shades within your painting dear Marina.. Opal is a wonderful Gem and so are you my friend..
Hi, David! Thank you! 🙂 Happy Monday! wishing a successful October to you, glad that you are back! Hey Marina, welcome ‘back’ – beautiful colours as always!